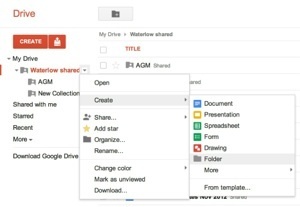 If you are an existing Google Docs user and have not made the change to the new ‘look’ interface you may find yourself rather disoriented when your Google Docs account turns into Google Drive. You may even get a fright if it first seems as though your documents have disappeared! Should you ever misplace a document, being Google there is a powerful search facility at the top of the page which should quickly locate things. If however you cannot remember how you identified your documents and just want to see a list, click ‘More’ on the left menu to reveal ‘All Items’ and click on that. As your collection of documents grows it is a good idea to make folders to organise them. To do this jusrt click the large orange ‘create’ button and then choose ‘folder’. You can then name and create a new best online casinos folder. If when you create a folder an existing folder is already open and it’s contents are displayed, then the new folder will be created as a sub-folder inside this. Once you have a folder it is simple to drag documents into it. A great use for folders is when working with others and sharing documents. It is time-consuming to share each new document individually, whereas if you set a folder to be shared then any document you drag into it will immediately be shared. You can also create sub folders in shared folders which have the same sharing permissions. This is also useful as any documents placed here will be organised for those you are sharing with too. When others first share new documents with you they appear under ‘Shared with me’ on the left menu. It is a good idea to drag anything you want to keep an eye on over to ‘My Drive’. You can also use an existing folders ‘context’ menu to create and share documents and sub-folders. Just click the little down arrow which appears to the right of any existing folder name in the menu when you move your mouse over it.